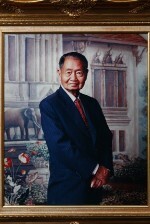 Thai Petroleum & Trading Co., Ltd. (TP&T) was founded with 1 million Baht registered starting fund in 1952. It was set up by Mr.Kachorn Tingthanathikul. The main businesses of the company are to Manufacture, Market and Distribute Lubricating Oils and Greases, Plastic Containers and Automotive Batteries. Since its first establishment, Thai Petroleum & Trading Co., Ltd. had been the sole importer and distributor for PENNZOIL and BARDAHL oil additive. Later in 1983, the company improved its production capacity to international standards, and was accepted and trusted by PENNZOIL USA to blend and package of its products in Thailand. This was an important step in developing the company to an international level. Additionally, the company set up tight quality control systems. Manufactured products are examined and analyzed until they are accepted and certified by the highest quality standards of PENNZOIL in Texas, USA. Later on, Thai Petroleum & Trading Co., Ltd. expanded its business by manufacturing STATES lubricants including grease and plastic containers for lubricants. The company set up factories with highly manufacturing technology which is accepted to international standards. In 2007, the company has fully acquired a local automotive battery company and started manufacturing Lead-Acid Automotive Battery under brand TPS. From the start, TP&T has contributed significantly to the development of the Thai Industry especially in the Petroleum field and has been a trustworthy supplier of high quality lubricant products and services. In August, 2011, the company has launched "PULZAR" lubricating oils and greases to substitute PENNZOIL which was ceased marketing activities in the same year. This consider as a major milestone for the company to spread its business to the world. 1952 TP&T, a local private owned company was founded by the late Mr.Kachorn Tingthanathikul (John K.C.Ting) importing lubrication products supplied to local industries i.e. rice mills.